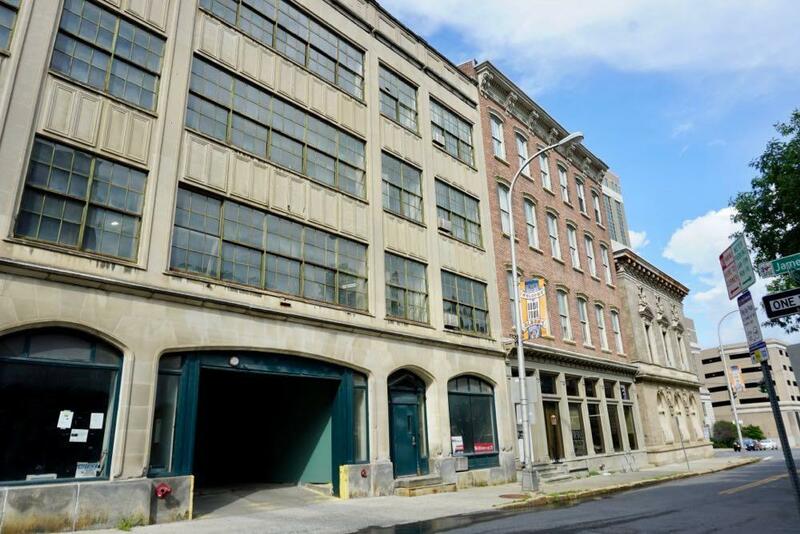 The residential conversion of the Kennedy Garage in downtown Albany is line for a $1 million grant. The Capital Region scored $67 million in the state's annual Region Economic Development Council awards/game show/porktacular on Tuesday. Here are details on the specific projects getting funding in the Capital Region are below, along with a bunch of that caught our eye. There are also region-by-region totals for the awards. A rendering of a potential gateway at Broadway and Clinton that Capitalize Albany released last year. A bunch of projects in downtown Albany are in line to get a slice of a $10 million block of money from New York State after the city was named one of the winners in the latest round of the state's Downtown Revitalization Initiative. Specifically, Capitalize Albany -- the development arm of the city -- put together an application that focused on the Clinton Square area of downtown. It's the section more or less centered on the intersection of North Pearl Street and Clinton Ave. The pitch was that this area is a major gateway to the city, is the interface for multiple neighborhoods, and already has some momentum in the form of real estate development, affordable housing, and the arts. Albany was in the running against a handful of other cities in this region, including Troy and Cohoes. So what's up for the cash? Here's the list, along with a few thoughts. One of the renderings from the Capital Region's Amazon HQ2 bid. Well, now the Capital Region's full bid is out thanks to Jon Campbell and the crew at the USA Today Network. They FOILed the bids for the Buffalo, Rochester, Syracuse, and Albany metros from Empire State Development and posted them online. Here's the Capital Region bid. 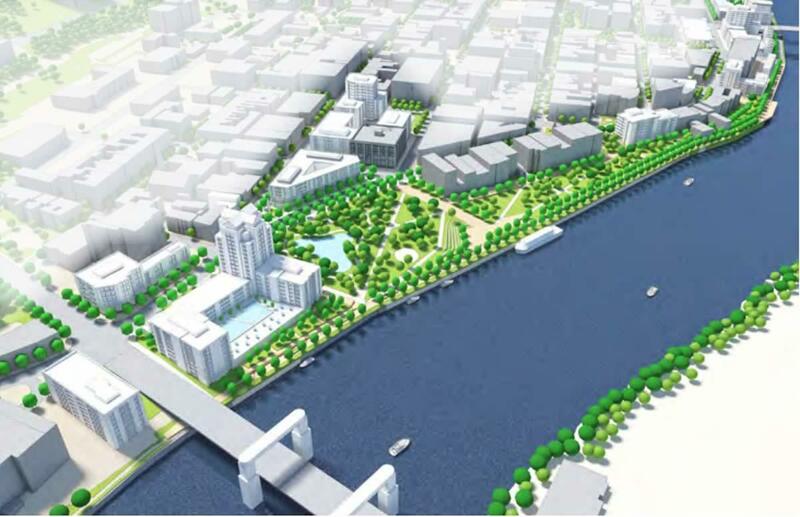 A conceptual plan for a reconfiguration of the riverfront in downtown Troy. The draft of Troy's new comprehensive plan -- Realize Troy -- was released this week after more than two years in the making. It's basically a proposed road map for the city's future over the next 25 years and beyond. The full draft is available over at the Realize Troy site. We read through the plan this week and picked out a handful of bits that caught our eye -- from a major reconfiguration downtown to... forks. 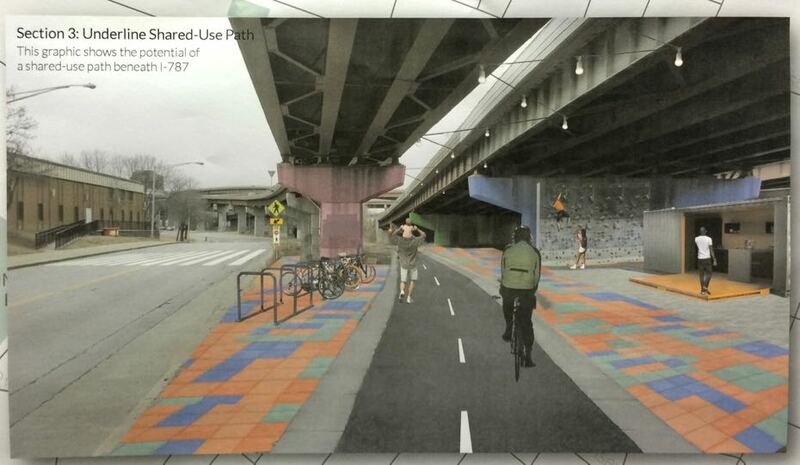 Albany's plan to build a connector between the Mohawk Hudson Bike Hike Trail and the Helderberg-Hudson Rail Trail got funding. The Capital Region scored $85 million in the state's annual Region Economic Development Council awards/game show porktacular on Wednesday. The region was a "top performer" for the second year in a row, and again landed the second-highest total of grants. Today is the day that cities and metropolitan areas all around the country are offering themselves up to Lord Bezos as his empire looks to build an off-world colony beyond Amazon Prime in Seattle. 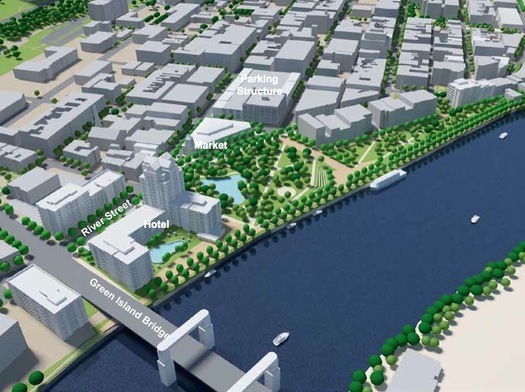 With Amazon specifying an interest in a downtown or urban location with a layout similar to its Seattle campus, CEG's centerpiece proposal is the Amazon Promenade. This downtown headquarters would straddle the iconic Hudson River, with a capacity for 2 million square feet of office space in the City of Albany's 25-acre site between the Times Union Center and Broadway and an additional capacity for 6 million square feet on 75 acres directly across the Hudson in the City of Rensselaer. 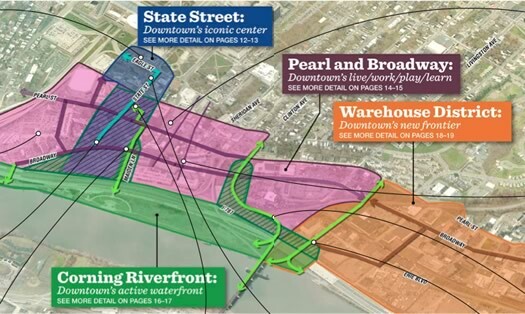 The Albany and Rensselaer sites could be connected with a pedestrian bridge across the Hudson, water taxies and/or a gondola. 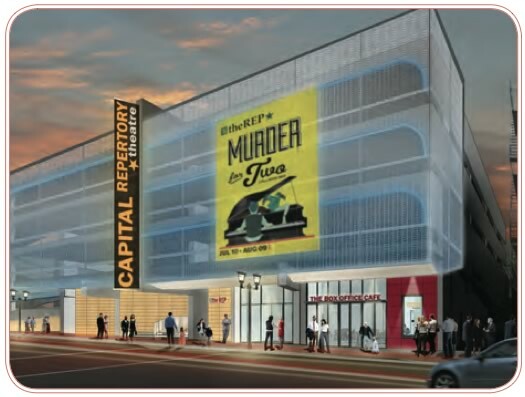 There are a handful of renderings -- and we've pulled them out for easy gawking. The online pitch also argues the region's case in terms of aspects such as education, housing affordability, natural disaster susceptibility, and crime. The proposed Palace expansion is back up for state money. The Capital Region Regional Economic Development Council released its 2017 progress report this week. And one of the things that's immediately notable about these reports is the list of proposed priority projects up for state money in the next round of the Cuomo administration's Regional Economic Development Council initiative. You know, these are the grants that are announced at an awards-show-like event, usually in December. The list usually includes some interesting bits, and it also sometimes surfaces notable projects that are in the works. From a 1938 Home Ownersâ€™ Loan Corporation map of Albany. 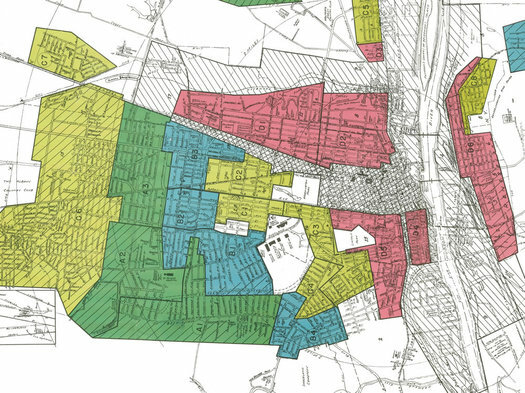 The Digital Scholarship Lab at the University of Richmond recently published a website displaying redlining maps from the 1930s for American cities with populations over 50,000. These so-called Residential Security Maps, along with detailed descriptions of urban neighborhoods, give us insight into how the flow of bank funds into some areas -- and their denial in others -- shaped the postwar American city. We researched the history of these maps, as well as related records pertaining to Albany, at the National Archives. Here's what we found. Originally published Thursday at 2:20 pm. Updated Thursday at 4:05 pm. 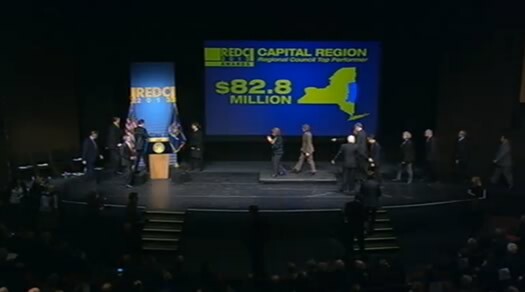 The Capital Region got $83.1 million in the state's annual Regional Economic Development Council awards/game show on Thursday. That total made it a "top performer" -- and it was the second-highest total of any region. The details on the specific projects getting funding in the Capital Region are below. There are also region-by-region totals for the awards. One bit of other news that came out of the presentation: Andrew Cuomo reiterated his support for allowing services such as Uber and Lyft to operate upstate. His statement -- "I guess I support Uber upstate." -- followed a deadpan joke by Empire State Development head Howard Zemsky about requesting an Uber to take him to The Egg from the ESP office in Albany -- the car showed up 2 hours and 45 minutes later and took him to Price Chopper. 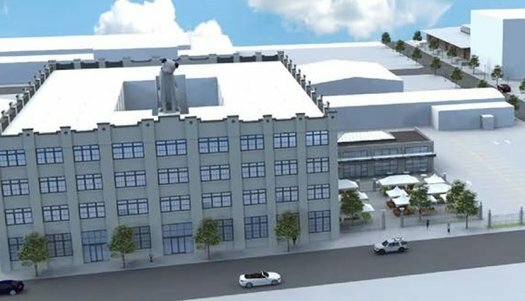 A rendering for the planned mixed-use conversion of the Nipper Building in Albany's Warehouse District. The Capital Region Economic Development Council recently released it latest batch of proposed priority projects. These are the projects the council will be suggesting get state funding in the next round of the Cuomo administration's Regional Economic Development Council initiative. Those awards are usually announced in December. These reports usually include some interesting bits and sometimes surface notable projects that are in the works. 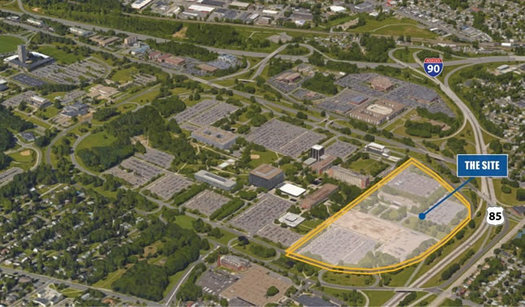 The RFP calls for plan that builds on the current redevelopment of the existing campus, reflects the area's character, and increases the City of Albany's tax base through a wide range of potential options including companies in the healthcare, technology, research, education, retail, and hospitality sectors. Uses could include offices, medical and laboratory facilities, retail shops, lodging, and ancillary parking. A minimum purchase price of $5.1 million is required and any proposal that includes residential use will not be accepted. The Cuomo admin has laid out a two-phase process for selecting the winning bidder. The first phase -- in which "potential developers will provide a description of the proposed uses for the site and demonstrate the need for or likely success of those uses" -- closes September 15. The three bidders with the highest scores will then move onto the second and final phase in which they'll have to provide more specific details about things like funding. 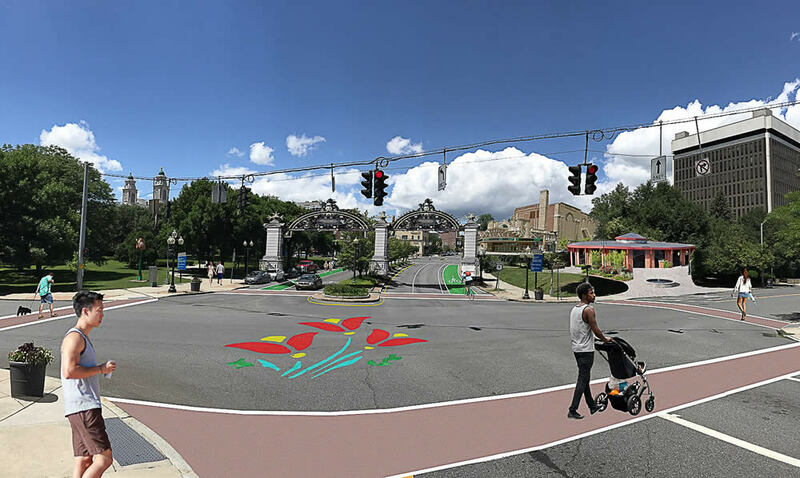 Catching up a bit: Plans, renderings, and slides from the recent public meetings for Realize Troy -- effort to develop a new comprehensive plan for Troy -- and are online. And they're worth having a look if you haven't seen them. If you'd like to just flick through one deck of slides, here's the overview presentation. The part we suspect that will first catch most people's eyes are some of the ideas floated for downtown Troy, including a re-imagining of the area just south of the Green Island Bridge with a permanent home for the farmers' market and a replacement for the Atrium. We've clipped those slides out -- they're after the jump if you'd like to have a quick look. The project is currently in the "plan development" phase. It's gathering feedback on the draft plan via an online comment form. Sheridan Avenue in Sheridan Hollow, looking east toward downtown Albany. 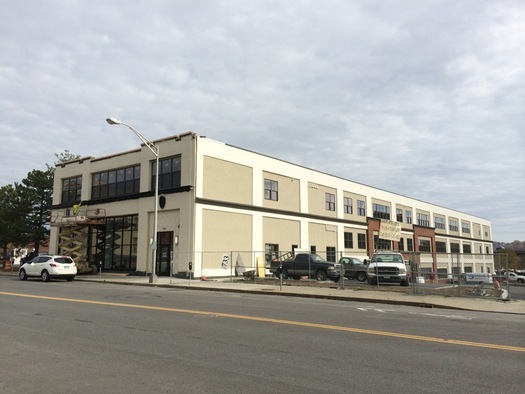 The most interesting real estate project in Albany -- and maybe the whole Capital Region -- has completed its first phase and is now moving onto phase two. Habitat for Humanity Capital District and a group of partners recently finished building 14 new homes in the Sheridan Hollow neighborhood, and work has already started on another 10 new homes nearby on Orange and Lark streets. At the same time, an org called Housing Visions is building 57 new residential rental units, along with mixed-use space that will include offices and a cafe. So, what's next? And how does this fit in with downtown Albany's ongoing residential transformation? We stopped by the project this week for a walk and talk with Habitat for Humanity Capital District executive director Christine Schudde. The Rochester-based grocery chain has a nearly religious following in the areas of upstate New York where it operates, but there are no outposts in the Capital Region. In locating a store at the vacant site downtown, it could simultaneously provide a needed amenity for the struggling neighborhoods nearby and create a regional attraction that would draw people from the surrounding office towers and suburban communities. Imagine a supermarket with a street-level cafe opening onto Hudson Avenue, beckoning to pedestrians along Broadway and Pearl Street or people in town for a show at the arena or a convention up the hill. Several floors of rental housing or condos above the store -- perhaps with requirements that some units be affordable -- that will give a further boost to the burgeoning residential options in the old business district and prevent the area between the Pastures and Sheridan Hollow, two predominately residential areas, from seeming lifeless after dark. Call it the Wegmans effect, a development strategy for lagging urban areas rooted in designer cheese. Wegmans, or something like it, could do for Albany what Fairway did for Red Hook. To be clear: There's no indication that Wegmans is actually considering this -- a spokesperson for Wegmans says as much to Vielkind, noting the company has looked at the Capital Region in the past but seen more opportunity in places such as Maryland and Virginia. And he figures it would take a push from Andrew Cuomo to make it happen. The former convention site has been the subject of some intrigue recently because the Capital Region's Upstate Revitalization Initiative proposal included mention of an almost unbelievably big "catalyst" project there -- 1,200 housing units, more than 400,000 square feet of office space, and 295,000 square feet of retail. As you know, the Capital Region didn't get one of the $500 million grants. Before that, there had been a pitch to build an aquarium, which also fizzled. Now it's unclear what -- if anything -- is going to happen at the site. One of the interesting angles to this topic is the question of whether downtown Albany should by vying for some sort of high-profile development piece like a Wegmans or (insert some other large, big-name retailer/project) -- or if it's better off cultivating the steady bit-by-bit development it's experienced in recent years. + Wegmans? Really? Please explain. 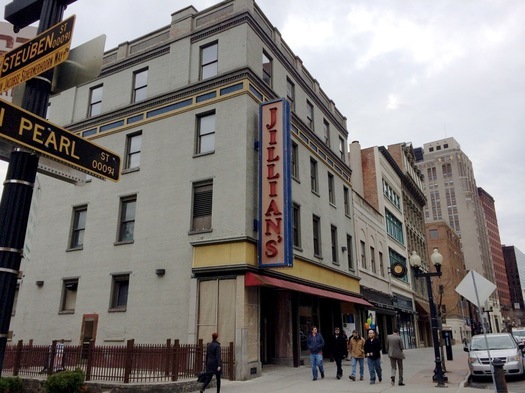 The former Jillian's building on Pearl Street is one of downtown Albany's biggest and most prominent venues. So as the neighborhood has evolved through a series of residential conversion projects and picked up momentum over the past few years, the site has been conspicuous for its lack of activity. That's now changing. The building has new owners, and they're working to turn it into a spot for a range of different uses. Here's the plan. The state of "The Village in the City." If there is one constant about cities, it is that they are always changing. Businesses open and close. People move in and out. In Albany a lot of the recent discussion about neighborhood ebb and flow has been focused on Lark Street and the Washington Park neighborhood. The last few years have seen a lot of change on the stretch of Lark between Madison and Washington, and the recent closing of Justin's leaves another empty storefront on the street. So is this part of the natural ebb and flow of a neighborhood? Or is it something more? 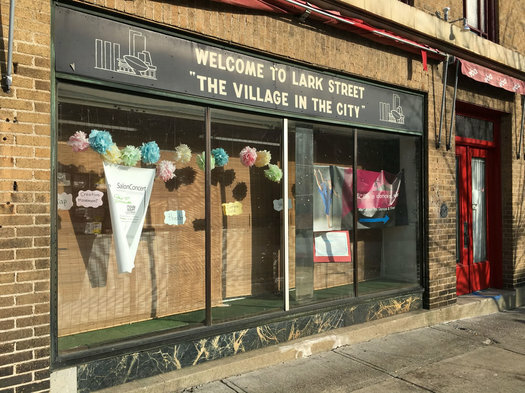 We asked a handful of people who live, work, and own businesses on Lark Street and in the surrounding neighborhood to share some of their thoughts about the direction of Lark Street -- and to tell us what they'd like to see happen in the neighborhood. We're really hoping that next Andrew Cuomo will have the regional representatives come up on stage and spin a wheel or something. update: Here's the list of projects that were awarded REDC money, both in the Capital Region and other regions.. 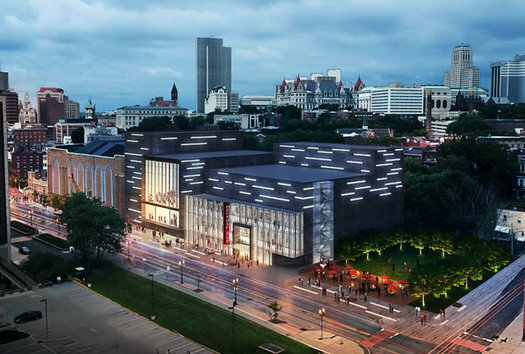 The Capital Region's money will go to a variety of projects including infrastructure, Capital Rep's renovation, the Good Market public market in the Warehouse District, expansion plans at Nine Pin Cider Works, the Tower on the Hudson project, and a music television show to be produced at Proctors. The list of Capital Region projects from the REDC booklet is embedded after the jump. The Capital Region left this year's state economic development grant game show with $98.1 million. Sure, that's a large chunk of money. But the big money this year was in snagging one of the $500 million Upstate Revitalization Initiative awards, a Cuomo admin program inspired in part by the "Bufallo Billion. 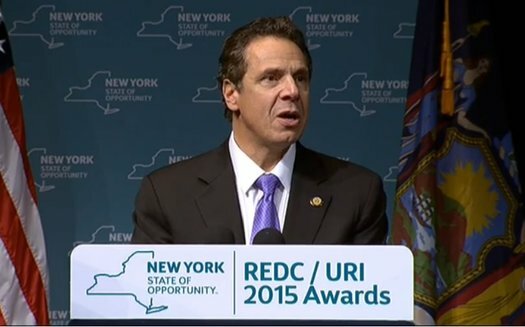 "* The three winning regions for the URI prizes were the Finger Lakes, Southern Tier, and Central New York. Here's a scan of the plan the Capital Region submitted. Officials have said that even if the region didn't win, the plan would still be useful as a map for future economic development. And here's a scan of the "priority projects" as part of the Capital Region's regular REDC app. Which projects got money -- and how much -- will be out later today. Some quick follow-up on 733 Broadway, the latest residential project in downtown Albany. The loft-style conversion, the roots of which stretch back to 2005, is aiming for occupancy on December 1, according to Norstar Development. 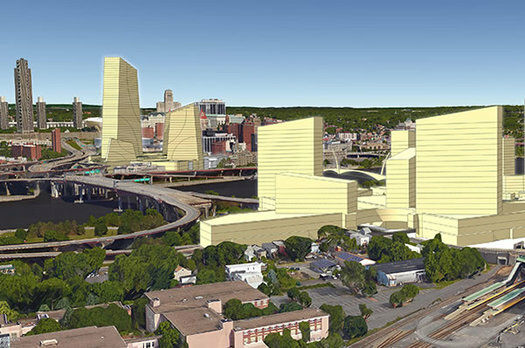 The project floated for this site in downtown Albany is almost unbelievably big. How do you make the case that you should get $500 million? 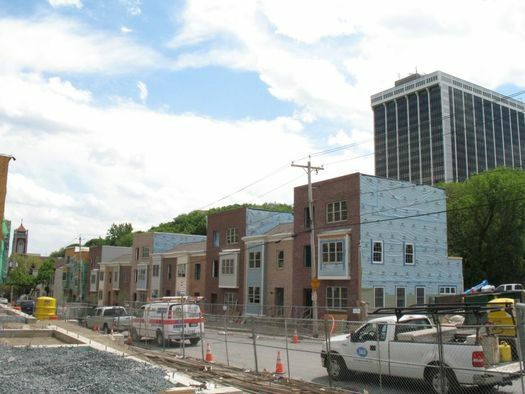 The regions competing for one of the three Upstate Revitalization Initiative awards from the state released their plans this week. One of the proposed priority projects. The Capital Region Economic Development Council recently released its list of proposed priority projects for 2015. These are the projects the council will be suggesting get state funding in the next round of the Cuomo administration's Regional Economic Development Council initiative. Last time out in the state's economic development game show -- er, we mean, regional economic development competition -- the Capital Region scored $60 million. These reports usually include some interesting bits, and they're can be especially interesting because they often surface notable projects that are in the works. Quirky's office on State Street in Schenectady. With respect to assets related to the business of Wink, Inc., the Company has entered into an agreement with Flextronics International USA Inc. for the sale of certain assets at a purchase price of $15 million. The sale will be subject to higher or otherwise better offers. The Company will look to conduct an auction, if other bids are received, and will be seeking court approval to have the sale close within approximately 60 days. The bankruptcy filing does not impact the Wink experience for users nor how Wink operates day-to-day. Wink's engineers and designers will continue to enhance the Wink platform to provide new, meaningful ways for customers to interact with their smart home. The Wink HUB and Wink Relay will continue to be available at The Home Depot and Amazon. Wink's customer support team will continue to provide the same quality assistance. Patrick Mahoney, a PR manager for Wink, said today via email that "the Schenectady team is not impacted by this process." And though the company doesn't share office-by-office numbers, he said that Wink overall has 80 employees. Earlier on AOA: What is this Quirky in Schenectady? CAPITAL 20.20 -- the working group that's developing the Capital Region's pitch for one of the three $500 million awards in the state's Upstate Revitalization Initiative -- has a series of "town hall" events lined up this week for gathering public input. The purpose of each region's Revitalization Plan will be to 1) provide a well-researched and credible argument that the region is ready for revitalization; and 2) to describe the transformation that will happen in the region if granted those funds. The project is also gathering input via a survey. The schedule of public events this week is after the jump. The first one is in Colonie late this afternoon (Monday). There are also events in Troy, Schenectady, and Malta this week. The plan identifies four zones downtown. The "playbook" for the Impact Downtown Albany project is out. It's aimed to be a set of specific ideas and steps the city can take to continue the redevelopment of downtown Albany -- touching on topics such as residential and retail development, taxes, parking, pop-up events, and branding. 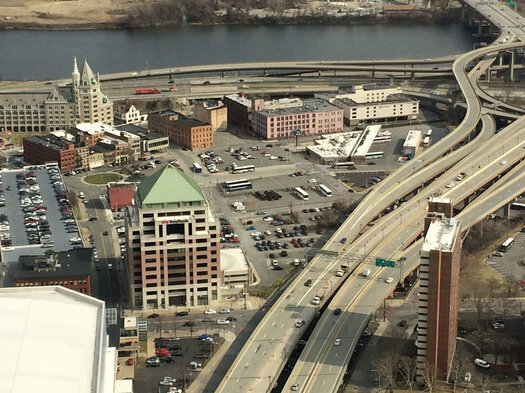 "Impact Downtown Albany was designed as a game changer," said Sarah Reginelli, the president of Capitalize Albany, the city's economic development arm. "It was designed as a tactical approach to downtown revitalization." The report was produced for Capitalize Albany by a team of consultants over the last two years. Capitalize Albany released it this week so that it might help the Capital Region's bid for one of those $500 million Upstate Revitalization grants from the state. "Downtown has wonderful assets already, downtown has a strong momentum," Reginelli told us Thursday. "Part of it is changing perceptions of downtown and understanding that this momentum has been occurring and that there is potential here for people to reach out and grab." 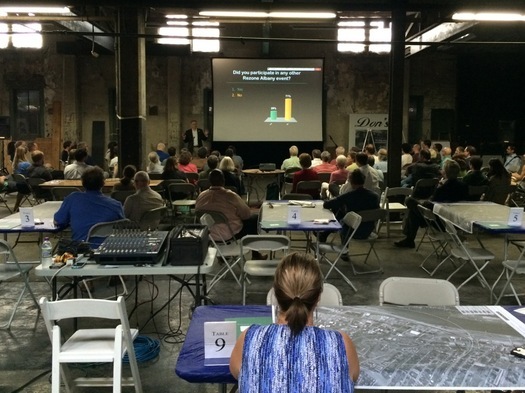 We stopped into the public workshop about rezoning Albany's Warehouse District Tuesday evening. It was interesting to hear people talk about their aspirations and concerns for a neighborhood that appears poised for a possible transition to something different. And if anything, it was heartening to see so many people -- more than 50, easily -- commit a few hours to discussing the future of their city on a beautiful summer evening. Many of the ideas expressed will sound familiar: a desire for walkability, waterfront access, mixed-use housing, boulevarding 787, ways of possibly fostering businesses that draw on the arts, a supermarket. There was also a notable segment of people who wanted to make sure industrial businesses aren't pushed out. This intensive look at the neighborhood continues through Friday, when there's another public session to discuss some of the work produced by the zoning consultants this week. So we'll probably circle back around to this topic again in the near future because there are a bunch of interesting threads. The most interesting real estate project in Albany -- and maybe the whole Capital Region -- is in Sheridan Hollow. Yep, that Sheridan Hollow, the neighborhood that has so often been bypassed, overlooked, and otherwise left with the short end of the stick throughout the city's history. So what's happening? Habitat for Humanity Capital District and a group of partners are in the process of building a new core at the heart of the neighborhood. 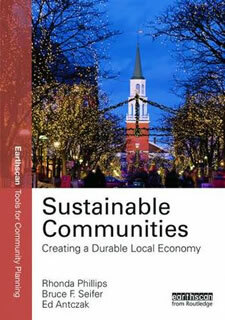 Could be interesting: Bruce Seifer, co-author of Sustainable Communities: Creating a Durable, Local Economy, will be giving a talk this Saturday in Troy as part of a Transition Troy event at Sage. The other thing that we did, which is not rocket science but it's pretty much behind everything that we did, is pretty simple. We asked people in need what they needed and then we tried to figure out how to meet their needs. We were more like a gardener for small businesses. We'd focus on small businesses and try to find ways to help them grow to become major employers and economic players. So, we did things...you know if they needed financing we ended up starting a small business loan fund. If they needed training around understanding finance, we set up training programs for them. Sometimes they said they'd like to work with other like type of businesses and learn from each other. So we would set up trade associations working in concert with them. You know, we would tend to them over the years. We provided ongoing technical business advice to those business people so if they had an issue on getting a permit or they had problem with sewer overflow or whatever it may be, we were always there trying to solve their problems. As a result of all of that, we ended up helping a lot of small companies become bigger companies. In addition to Seifer's talk, the event at Sage will also include "a few brief, uplifting 'pop-up' presentations from leaders of recent local initiatives." The event is Saturday, April 11 from 3-6 pm in the Bush Memorial Auditorium. It's free and open to the public. 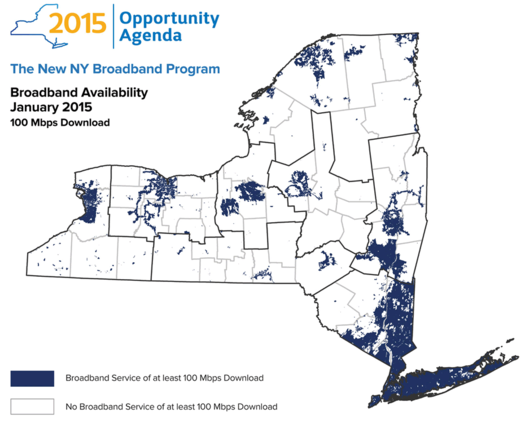 One million people in New York State currently can't get broadband internet access, and 7 million -- including roughly 70 percent of upstate -- can't get access that would be considered very-fast* high speed access. So reports the Cuomo admin Friday as part of its pitch for a plan to put $500 million of the bank settlement money toward extending broadband internet access to every part of the state by 2019. "What would it take to turn this into..."
960 Broadway in Albany, viewed from from North Pearl Street. Maybe you've stood outside one of the Capital Region's many old, underused industrial buildings and thought: "What would it take to turn this into (insert thing)?" Well, The Preservation League of New York and the Troy Architecture Program have provided some answers to that question. 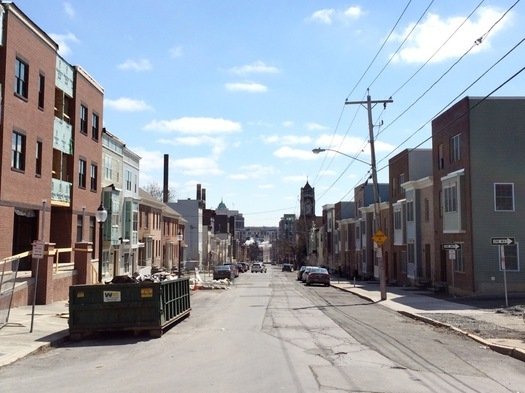 Specifically, they've provided some detailed answers -- about building condition, code issues, variances, and costs -- for what it would take to transform a handful of buildings in Albany, Troy, Schenectady, and Amsterdam. One example: 960 Broadway in Albany's Warehouse District, which a developer would like to flip to restaurant and residential space. 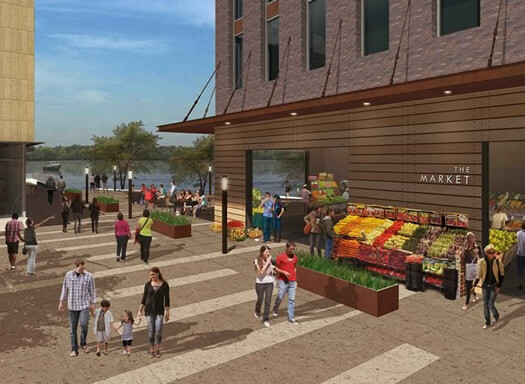 The planned permanent space for the Troy Waterfront Farmers' Market was awarded $1.5 million. Capital Region projects got a combined $60 million in the Regional Economic Development Council awards announced Thursday. An easy-scan table of the projects is after the jump. The region snagged $82.8 million last year. But this time around it was not a "top performer" in the state's annual Who Want's to Win Some Pork?!?! game show -- it ended up receiving the second-lowest amount out of the state's 10 regions. A screengrab of the map. The city of Troy currently has more than 140 foreclosed properties up for potential sale. The city is accepting sealed bids on the properties -- many of which are vacant land -- between now and December 19. The map is the creation of Anasha Cummings, who was prompted to make it because, as he said to us in an email, "I don't think a PDF on a website is a good way to browse for properties you might want to buy." 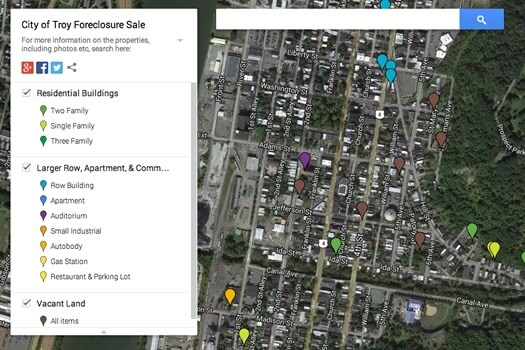 Cummings says he's currently in the process of filling in some of the holes in the list (some properties don't have exact addresses) and matching up the properties with more information about them from the city's real property database (important info like square footage, even a photo). This situation highlights an issue that's frustrated us for a long time: local municipalities often post information/data in ways that make it hard to find or use. 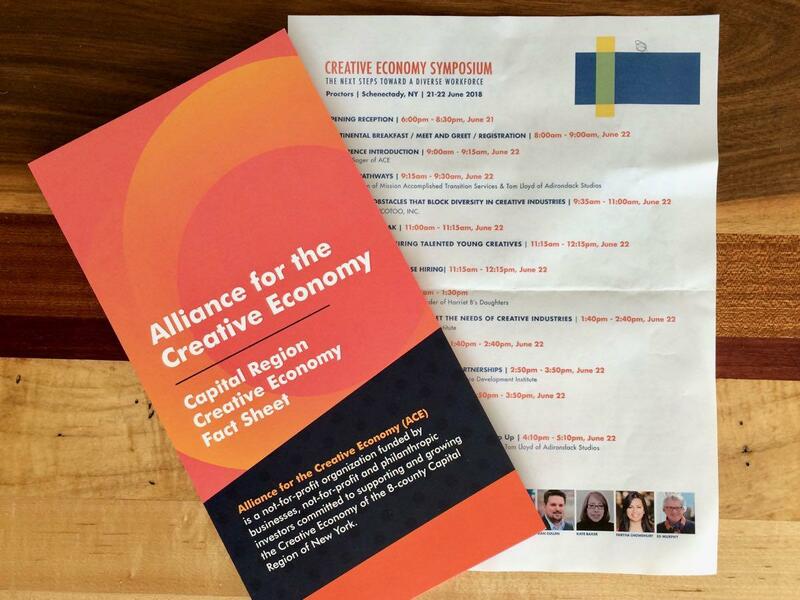 The Regional Alliance for a Creative Economy -- a local multi-org effort studying how to spur creative industries in the Capital Region -- released its report on the local creative economy today at Proctors. And -- spoilers -- it found that are many people involved in creative jobs. The report -- "Leveraging Regional Assets for A Vibrant Future," compiled the consultancy Mt. 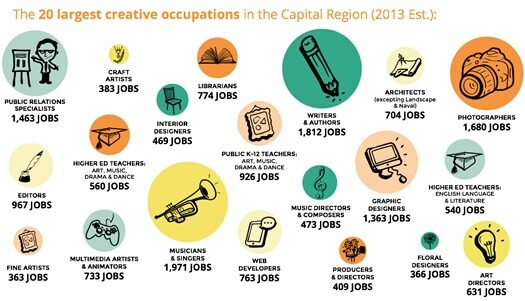 Auburn Associates -- concluded there are 30,591 jobs in the Capital Region in what it considers creative industries. And it included a bunch of recommendations about how the region could advance these industries and, as the thinking goes, help the region as a whole. Here are some highlights from the report, and a few thoughts. 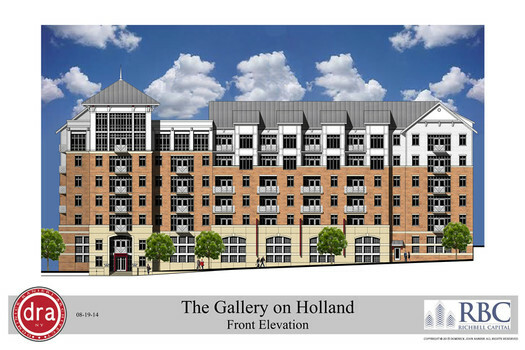 A quick update another apartment project in Albany: The rendering above is for "The Gallery on Holland," a 125-unit apartment building planned for 25 Holland Ave (near the intersection with Delaware Ave). The building will be 7-stories and include 160 interior parking spaces. The company behind it is Richbell Capital (RBC), which also built the Paddocks of Saratoga. RBC managing director William Hoblock said if the BZA approval comes through and everything lines up as now planned, demolition could start this winter, and the project could be completed by 2016. + This 25 Holland project is just about a half mile from the Park South mixed-use project that will include more than 265 residential units. + On the city's border with Menands is the loft conversion of the old Albany International headquarters (it was also before the planning board last week). + Multiple projects downtown -- completed or planned -- like the Monroe. + A range of smaller conversion projects such as 27 Western (completed) and 960 Broadway (planned, it was before the planning board last week). The proposed permanent home for the Troy Waterfront Farmers' Market is one of the projects seeking state funding. The Capital Region Economic Development Council recently released its list of proposed priority projects for 2014. These are the projects the council will be suggesting get state funding in the next round of the Cuomo administration's Regional Economic Development Council initiative. (Or, as we've come to think of it, a game show called Who Wants to Win Some Pork?) The Capital Region scored almost $83 million the last time out. Not all of these projects will necessarily get funding (or get funded at the requested levels) but it's interesting to see what's in contention because all sorts of interesting bits bubble up in these applications -- stuff that maybe you missed the first time around, or hasn't gotten a lot of attention. 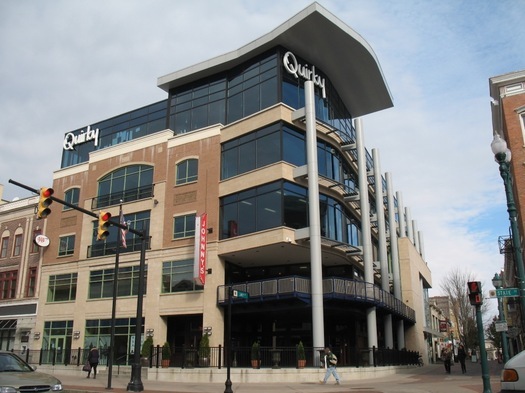 An example: A company wants to build a free wireless internet access service for downtown Troy. We put together an easy-scan listing, along with a map, after the jump. We've also highlight a few projects that caught our eye. A candidate for conversion to a restaurant and apartments. The Capital Region has a bunch of former industrial buildings -- some a century or older -- that are currently vacant and under used. And a new project is aiming to map out a future for these buildings. 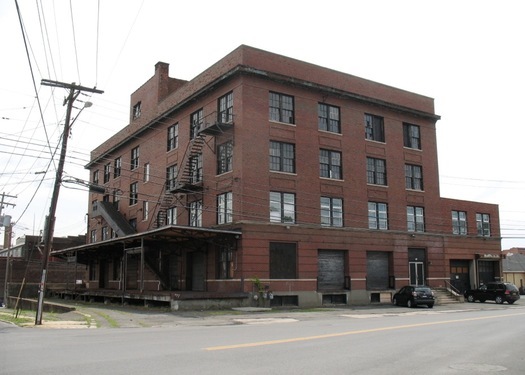 The Preservation League of New York introduced the Industrial Heritage Reuse Project Wednesday outside a century-old building on Broadway in North Albany that once housed a liquor distributor. 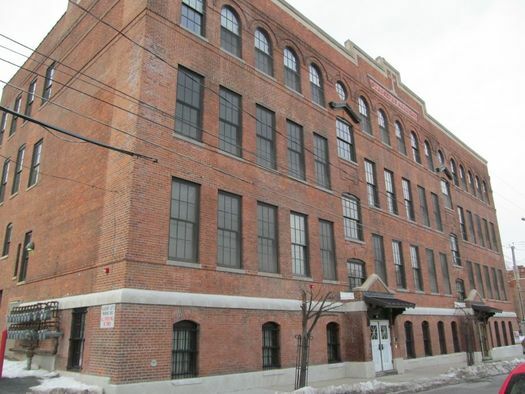 That building, along with four others in the Capital Region, will be the subject of analysis looking at how to jumpstart the redevelopment of those buildings for new uses. "We feel these buildings are assets rather than liabilities," Preservation League president Jay DiLorenzo said on the sidewalk along Broadway. GE CEO Jeffery Immelt, Andrew Cuomo, Alain Kaloyeros, and a large portion of the Capital Region's state and local reps were at the GE Global Research Center in Niskayuna today for the announcement of a new $500 million consortium that's being touted as both a key part of the next era in electronics and a future generator of thousands of jobs (including "at least 500" in the Capital Region). The New York Power Electronics Manufacturing Consortium will be anchored by GE and the College of Nanoscale Science and Engineering, and will be backed in part by $135 million in funding from New York State. The consortium will focus on what Kaloyeros called the "next generation of semiconductors," with applications across many different industries. The fab in Luther Forest in Malta. So, there's planning to spend some money, and there's planning to spend some money. This is the latter: The head of the holding company that owns GlobalFoundries tells Reuters it has received a commitment from its Abu Dhabi state investment fund backers to spend $9-10 billion on expanding capacity at GloFo's facility in Malta. 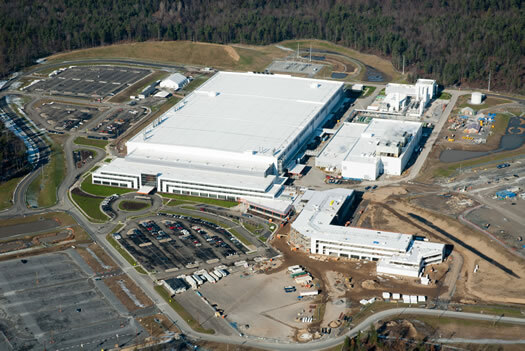 The New York factory, which started operations in 2012, has the capacity to produce 300mm wafers at around 60,000 a month. The wafers are used to create integrated circuits, which are at the heart of all electronic devices. ATIC wants to expand the factory to produce 20 and 14 nanometer nodes, which will be growth areas in the next three to four years, Ajami said. Utilizing smaller nodes, crucial parts of computer chips, is a vital part of making electronic devices smaller, such as thinner mobile phones. Growth rates in the semiconductor industry, which has been hit by falling demand for personal computers as people switch to mobile devices such as tablets, are around the high single- digits, Ajami said. The Biz Review's Adam Sichko puts the news in some perspective -- the new money would basically double GloFo's investment at the Malta site to date -- and highlights what's still not known -- mainly, whether this means a second fab is on the way. The company has gone through the necessary local approvals for a second fab, but it's yet to publicly commit to building one. Capital Region, come on down, you just won almost $83 million in pork! Updated with a map of Capital Region awards, along with an easy-scan table. The Capital Region scored $82.8 million in funding for projects in the third round of the Cuomo administration's Regional Economic Development Council initiative. A list of the Capital Region projects funded is embedded after the jump. It was the second-highest total among the state's regions, behind only Long Island's $83 million. 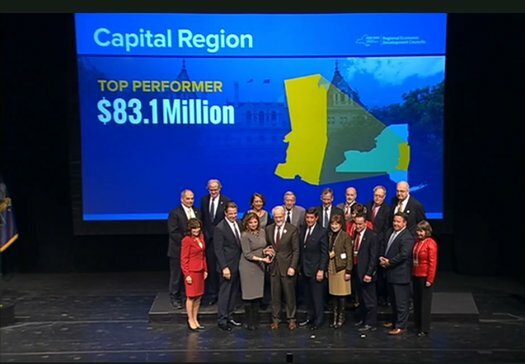 And the Capital Region was tabbed as "top performer," meaning it and the other likewise labeled regions got about $20 million more than the, uh, not-top performers. It was a bit of a turn around for the Capital Region's Economic Development Council, which had previously -- what would be Cuomomian word here -- underperformed in the previous two funding rounds. This time the Capital Region's effort was headed up by Albany Med CEO James Barba and UAlbany president Robert Jones.